Scientists at McGill have found the answer to a question that perplexed Charles Darwin. So much so, that it actually led him to doubt his own theory of evolution. He wondered, if natural selection works at the level of the individual, fighting for survival and reproduction, how can a single colony produce worker ants that are so dramatically different in size—from the "minor" workers with their small heads and bodies, to the large-headed soldiers with their huge mandibles—especially if, as in the genus Pheidole, they are sterile? The answer, according to a paper published today in Nature, is that the colony itself generates soldiers and regulates the balance between soldiers and "minor" workers thanks to a seemingly unimportant rudimentary "organ" which appears only briefly during the final stages of larval development. And only in some of the ants—the ones that will become soldiers. 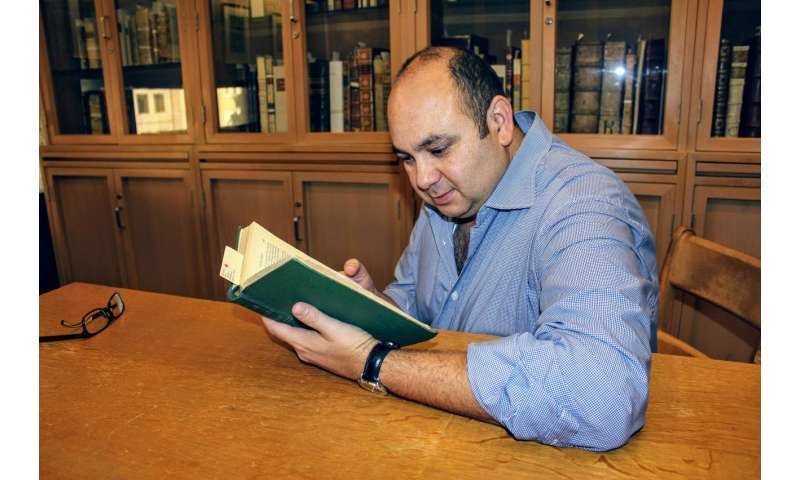 "It was a completely unexpected finding. People had noticed that during the development of soldiers that a seemingly useless rudimentary "organ" would pop up and then disappear. But they assumed that it was just a secondary effect of the hormones and nutrition that were responsible for turning the larvae into soldiers," says Ehab Abouheif from McGill's Biology Department, the senior author on the paper. Rajendhran Rajakumar the first author adds, "What we discovered was that these rudimentary "organs" are not a secondary effect of hormones and nutrition, but are instead responsible for generating the soldiers. It is their passing presence that regulates the head and body of soldiers to grow at rapid rates, until you get these big-headed soldiers with huge mandibles and big bodies." Abouheif has been studying wings in ants for the past twenty-three years. He was curious about the function of the wing imaginal disc which appear, transiently, in the final stages of larval development among the soldier ants. Even though the soldier ants never actually develop wings. So he and his team, spent nine years in the lab, using various techniques (surgical and molecular) to cut away portions of the rudimentary wing discs from the larvae of soldier ants in the widespread and very diverse Pheidole genus. They discovered that by doing so, they affected the growth of the head and the body. 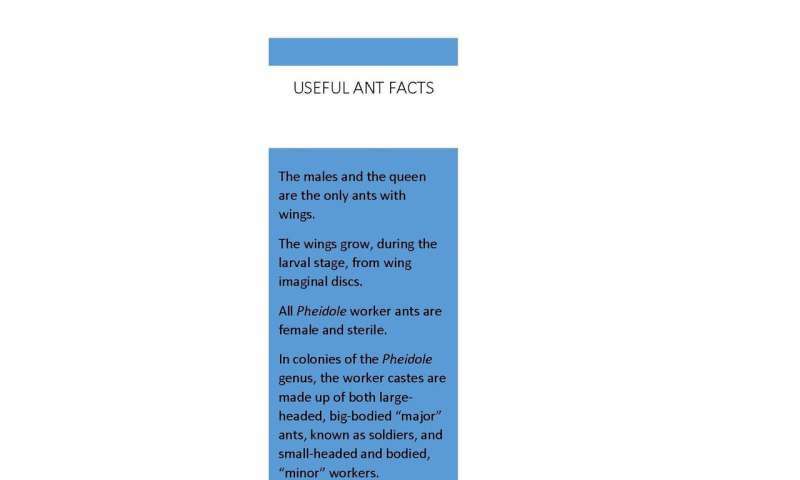 Indeed, they found that they were able to scale the size of soldier ants by cutting away differing degrees of the imaginal wing discs, with a corresponding decrease in the size of the heads and bodies of the soldier ants. It was clear confirmation that the rudimentary wing discs play a crucial role in the development of soldier ants. The researchers also discovered that the colony as a whole maintains the balance between soldiers and minor workers by regulating the growth of the rudimentary wing discs in larvae. 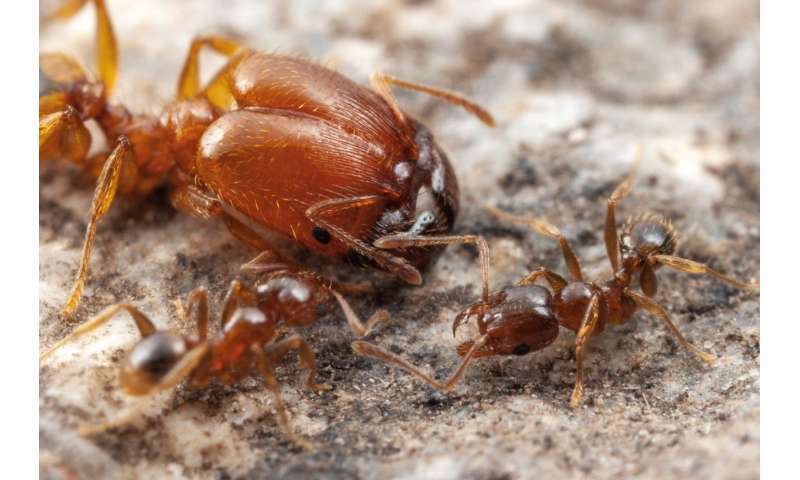 Earlier research had shown that the ratio of "minor" workers to soldiers remains constant in all colonies of the Pheidole genus, with a proportion of "minor" workers at 90-95 % to 5-10% soldiers. The McGill team has found that the soldier ants maintain this ratio by halting the growth of the rudimentary wing disc with an inhibitory pheromone when there are too many soldiers. However, the colony is able to ramp up the number of soldier ants very quickly if it is under threat or the numbers of soldiers have dropped for some reason, because the rudimentary wing discs that play such a crucial role in regulating the number of soldier ants appear only in the final stages of larval development. Based on his teams' discovery in ants, Abouheif proposes that rudimentary organs may play a much larger role in an organism's development than had previously been imagined. "Until now, people have assumed that these organs simply offer evidence of evolution and common descent, overlooking any current functions for them. Now that we know the crucial role played in Pheidole ant colonies by the rudimentary wing disc, it means that we will have to go back and look at other rudimentary organs in the same light. Who knows what scientists will discover?" What happens if you pick & drop Soldiers from Several Different Colonies into a Single Colony ? They would kill each other because each colony has unique chemical signatures to tell each other apart. Once more, we see that nature rarely let's anything go unused. We just don't understand it yet. Junk DNA? Oh, it does have a function! The article has an unfortunate ingress, since Darwin's problem was that he did not know of genes. Since genes can be selected for various traits - which is why organisms can have several such - there is nothing problematic in species' diversity. Nothing in the article discuss disuse. But disuse (and use) is what we expect and see in evolution, such as extinct populations, parasite simplification and vestigial organs. And I doubt you know what "junk DNA" is, since the original definition was *precisely* disused pseudogenes (inactivated genes). Even if you extend the concept to non-gene DNA - which is an unfortunate conflation - a typical eukaryote genome is 80 % dysfunctional. Be warned, people who usually flog this dead horse is falsehood peddling creationists. Torbjorn, we should not "expect" to see anything in evolution, as it is a completely unproven theory. Instead we should have our eyes wide open and expect to have our thinking changed with other new information. This article especially is one that implies that our thinking in evolution is actually wrong. We are not beating a dead horse, but continue to point out massive holes that evolution cannot answer. You should get off of your podium, and humbly seek answers for these conundrums. "It was a completely unexpected finding. People had noticed that during the development of soldiers that a seemingly useless rudimentary "organ" would pop up and then disappear. Well, didn't get quoting right in previous unscrewed before the timeout got me. Perhaps I should not have introduced this as a second, too simplistic example of stuff fournd to have function after all. I meant no reference to this article and certainly not creationism.